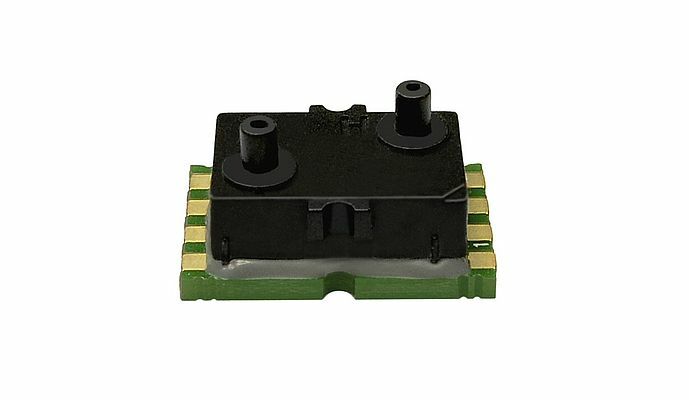 First Sensor presents a new version of its proven ultra-low differential pressure sensors with 3 V supply and linearized I²C bus output. The low profile, manifold-mountable LMI series sensors with measuring ranges from 25 Pa (0.1 inH2O) Full Scale are based on thermal micro-flow measurement within the silicon sensor chip. Due to their excellent sensitivity, accuracy, offset long term stability and long service life, LMI sensors are ideal for differential pressure gas flow measurement in bypass configuration. For battery powered applications the sensor features a low-power mode with minimal standby current. The innovative micro-flow technology decreases the flow through the sensor by several orders of magnitude compared to other flow-based pressure sensors. Due to the extreme miniaturization of the flow channel the series ensures superior immunity to both dust-laden and humid air. Additionally, there is no need to recalibrate or correct the sensor output signal when using long connecting tubes and input filters. Further, the semiconductor chip technology enables extremely low production tolerances and cost-effective mass production.